For other people named Kevin Carter, see Kevin Carter (disambiguation). 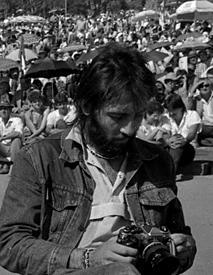 Kevin Carter (13 September 1960 – 24 July 1994) was a South African photojournalist and member of the Bang-Bang Club. He was the recipient of a Pulitzer Prize for his photograph depicting the 1993 famine in Sudan. He died by suicide at the age of 33. His story is depicted in the 2010 feature film The Bang-Bang Club, in which he was played by Taylor Kitsch. Kevin Carter was born in Johannesburg, South Africa and grew up in a middle-class, whites-only neighborhood. As a child, he occasionally saw police raids to arrest blacks who were illegally living in the area. He said later that he questioned how his parents, a Catholic, "liberal" family, could be what he described as 'lackadaisical' about fighting against apartheid. After high school, Carter dropped out of his studies to become a pharmacist and was drafted into the army. To escape from the infantry, he enlisted in the Air Force in which he served four years. In 1980, he witnessed a black mess-hall waiter being insulted. Carter defended the man, resulting in him being badly beaten by the other servicemen. He then went absent without leave, attempting to start a new life as a radio disc-jockey named "David". This, however, proved more difficult than he had anticipated. Soon after, he decided to serve out the rest of his required military service. After witnessing the Church Street bombing in Pretoria in 1983, he decided to become a news photographer and journalist. Carter had started to work as a weekend sports photographer in 1983. In 1984, he moved on to work for the Johannesburg Star, went on exposing the brutality of apartheid. Carter was the first to photograph a public "necklacing" execution by black Africans in South Africa in the mid-1980s. Carter later spoke of the images: "I was appalled at what they were doing. But then people started talking about those pictures... then I felt that maybe my actions hadn't been at all bad. Being a witness to something this horrible wasn't necessarily such a bad thing to do." In March 1993, Robert Hadley of the UN Operation Lifeline Sudan offered João Silva the opportunity to travel to Sudan and report about the famine in South Sudan embedding with the rebels in that area's civil war. Silva told Carter, who felt it was an opportunity to expand his freelance career and use work as a way to address personal problems. Operation Lifeline Sudan had been having funding difficulties, and the UN believed that publicizing the area's famine and needs would help aid organizations sustain funding. Silva and Carter were apolitical and desiring only to photograph. After flying to Nairobi, the two found out that new fighting in Sudan would force them to wait in that city indefinitely. During this time, Carter made a day trip with the UN to Juba in the south Sudan to photograph a barge with food aid for the region. Soon afterward, the UN received permission from a rebel group to fly food aid to Ayod. Hadley invited Silva and Carter to fly there with him. Once in Ayod, Silva and Carter separated to shoot photos of famine victims, discussing between themselves the shocking situations they were witnessing. Silva found rebel soldiers who could take him to someone in authority. Carter joined him. One of the soldiers, who did not speak English, was interested in Carter's wristwatch. Carter gave him the cheap watch as a gift. The soldiers served as their bodyguards. Carter shot an image of what appeared to be a little girl, fallen to the ground from hunger, while a vulture lurked on the ground nearby. He told Silva he was shocked by the situation he had just photographed, and had chased the vulture away. A few minutes later, Carter and Silva boarded a small UN plane and left Ayod for Kongor. Sold to The New York Times, the photograph first appeared on 26 March 1993, and syndicated worldwide. Hundreds of people contacted the newspaper to ask the fate of the girl. The paper said that according to Carter, "she recovered enough to resume her trek after the vulture was chased away" but that it was unknown whether she reached the UN food center." In April 1994, the photograph won the Pulitzer Prize for Feature Photography. In March 1994 Carter took a photograph of the three Afrikaner Weerstandsbeweging members being shot during their abortive invasion of Bophuthatswana just before the South African election. Halfway through the incident, Carter ran out of film, but still got enough pictures to supply newspapers around the world. Eamonn McCabe of The Guardian said: "It was a picture that made nearly every front page in the world, the one real photograph of the whole campaign." In April 1994, Carter's photograph of a starving Sudanese child being eyed by a vulture won the Pulitzer Prize for Feature Photography. The 1996 song "Kevin Carter" by rock band Manic Street Preachers, from their fourth album Everything Must Go, was inspired by Carter's life and suicide. The lyrics were written by Richey Edwards shortly before his own disappearance. ^ McCabe, Eamonn (30 July 2014). "From the archive, 30 July 1994: Photojournalist Kevin Carter dies". the Guardian. Retrieved 20 December 2018. ^ a b Marinovich & Silva 2000, pp. 39–41. ^ "First Draft by Tim Porter: Covering War in a Free Society". www.timporter.com. Retrieved 3 November 2018. ^ Marinovich & Silva 2000, p. 110. ^ Marinovich & Silva 2000, pp. 109-110. ^ Karim, Ataul; Duffield, Mark; Jaspers, Susanne; Hendrie, Barbara (June 1996). "Operation Lifeline Sudan – A review". www.researchgate.net. ResearchGate. Retrieved 30 September 2017. ^ Marinovich & Silva 2000, p. 113. ^ Marinovich & Silva 2000, p. 114. ^ Marinovich & Silva 2000, p. 116. ^ Marinovich & Silva 2000, pp. 152–153, Marinovich explains the soldiers as bodyguards. ^ "Carter and soldiers". www.vimeo.com. ^ Marinovich & Silva 2000, p. 118. ^ "Editors' Note". The New York Times. Retrieved 1 September 2016. ^ Rojas, Alberto (21 February 2011). "Kong Nyong, el niño que sobrevivió al buitre / Kong Nyong, The Boy Who Survived the Vulture". El Mundo (in Spanish). Archived from the original on 30 June 2017. Retrieved 29 August 2017. ^ Eamonn McCabe (30 July 2014). "Photojournalist Kevin Carter dies – obituary: from the archive, 30 July 1994; Media". The Guardian. Retrieved 27 October 2015. ^ Newark 2013, p. 96. Marinovich, Greg; Silva, João (20 September 2000). The Bang Bang Club: Snapshots from a Hidden War. New York, N.Y.: Basic Books. ISBN 0-465-04413-1. LIBRIS 4962156. Newark, Tim (2013). The Book of Camouflage: The Art of Disappearing. London: Bloomsbury Publishing. ISBN 978-1-4728-0293-4. Fujiwara, Aiko (2005). Ehagaki Ni Sareta Shōnen [Postcard Boy]. Chiyoda, Tokyo, Japan: Shueisha. ISBN 4-08-781338-X.